Memorial for Douglas Page | Felix Graf von Luckner Gesellschaft e.V. 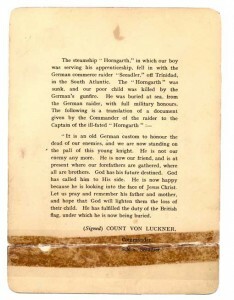 Count von Luckner was remarkable for the fair and humane way he treated the “enemies.” The von Luckner Society believes that this is an important part of his legacy. 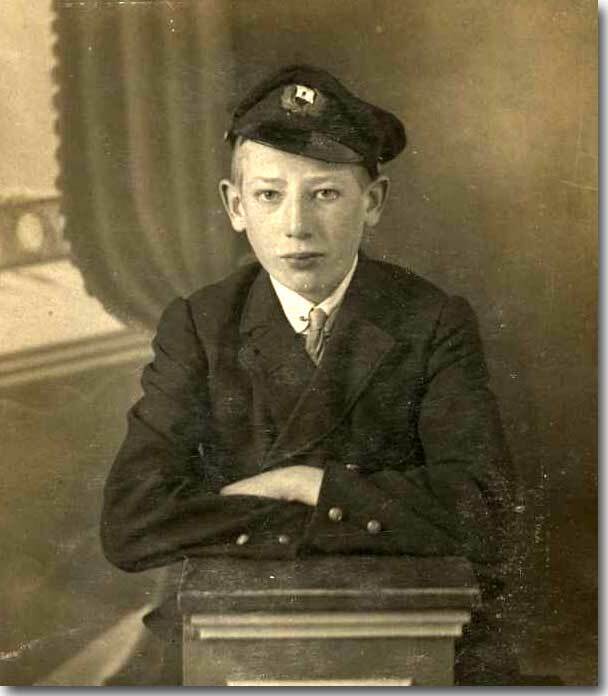 …only one seaman (the freighter “Horngarth” from Cardiff) died after having injured by hot water caused by a leak in a steam pipe. This damage was caused by a shell of the “SEEADLER”. 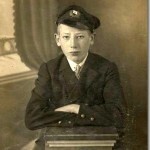 The seaman was Douglas Page. 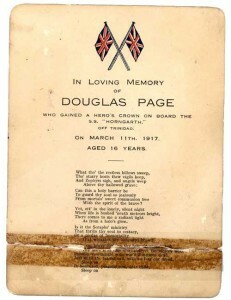 His grand nephew (Ross Pooley) contacted us and provided pictures of Douglas and a funeral card and letter from the Count. He thinks that Douglas was treated very well by the Germans who tried to help the injured (4 were injured by the hot water) the best way they could. Unfortunately, Douglas died and was buried at sea. 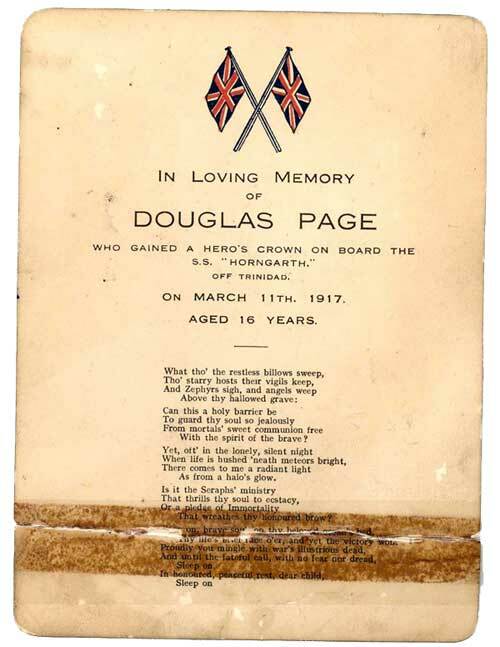 The family of Douglas Page still has not forgotten the young man as well as the fair and human way the Germans treated the injured and tried to help them the best way they could. The Germans were really sad when they learned that for Douglas Page any help was too late. 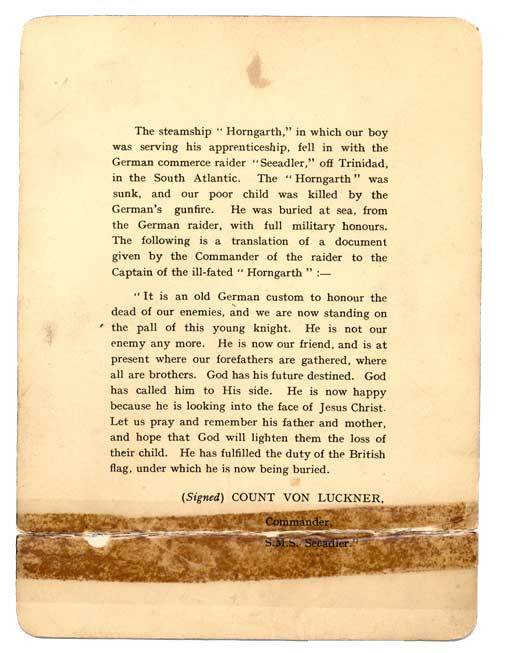 Von Luckner himself later on sent a letter to the family explaining that treatment, so the memories on him are kept alive by them until now.